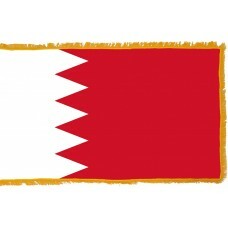 The Bahrain flag features two colors: red and white. 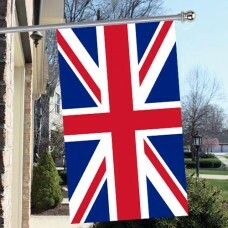 The left side of the flag is white and the right side is red. The colors are divided by a serrated line, leaving 5 triangles. The 5 triangles on the serrated edge, represent the 5 pillars of Islam. The red color is the traditional color for all the Arab flags and it symbolizes their beliefs and the Kharijite sect of Islam and the white color signifies peace and harmony. 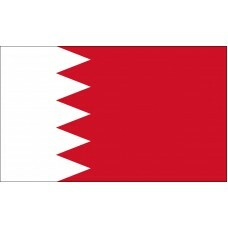 The serrated edge on the Bahrain flag was included to be able to distinguish it from its neighboring Arab countries. Over the years, the number of points/triangles on the flag has changed several times. Between 1932-1972 the flag had 28 triangles, between 1972-2002, it had 8 triangles and from 2002 until today, it has 5. 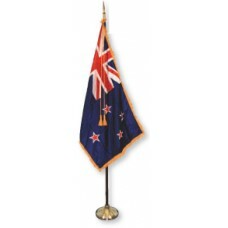 The current flag was adopted on February 14th, 2002. Bahrain is a very small island country located between Quatar and Saudia Arabia. Due to its central location on the Persian Gulf, it has been a major target for invasion throughout history. From 1783, the Al Khalifa family from the Bani Ubtah Tribe ruled the nation after they re-captured Bahrain from Persia but due to the constant invasions, they had to seek help from the British and in the 1830s, Bahrain became a British Protectorate, when they needed support against the Ottoman Turkey. Bahrain remained a British Protectorate until 1971, when it finally obtained independence from Great Britain. Due to its precarious location, Bahrain tries to remain neutral in foreign affairs and between warring countries. Despite being the smallest Arabian country, it is one of the quickest developing nations and it was the first amongst the Arab countries to discover petroleum in 1932. The economy in Bahrain is also rapidly developing and it is starting to become a popular tourist destination. The famous "Mesquite Tree" attracts over 50,000 tourists a year. It is a tree that stands alone in the desert of Bahrain and has done so for over 400 years. It is a big mystery as to how the tree has survived as nobody knows where its water source comes from. Another large tourist attraction is the "Al Fateh Mosque" which is one of the largest mosques in the world and can accommodate up to 7,000 people. The word Bahrain is derived from "Al-Bayran" which translates to two seas. The two seas refer to the sweet water springs and the salty seas that surround the country. The largest city in Bahrain and the Capital is called Manama, which is home to the Bahrain National Museum which is another popular attraction.